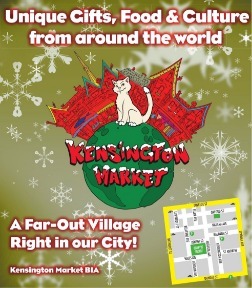 Kensington Market has long been an important shopping , foodie, hangout, and tourist destination. Cherished by Torontonians and visitors alike, this thriving mixed commercial-residential neighbourhood is well known for its independent spirit, colourful shopfronts, vibrant murals, charismatic locals, family-friendly Pedestrian Sunday events, and over 240 unique and eclectic businesses. This richly multicultural, open-air marketplace meets all needs: fresh produce, cheese, meats, bread & deserts, bulk spices/nuts/sweets, flowers, restaurants, cafes, bars, live music, local fashion designers & acclaimed vintage clothing, art, music, bike & skate shops, electronics, pet supplies, home-wares, and many specialty items from around the globe. 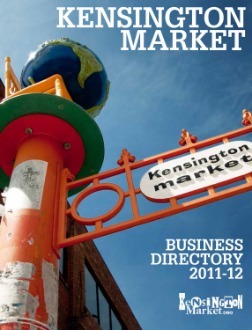 The Kensington Market Business Improvement Area (BIA) was formed in 2009 and represents over 240 businesses. Kensington Market is 1 of 82 BIAs throughout Toronto and is the voice of our business community. Augusta Ave. from Dundas St. to College St.
Nassau St. from Bellevue Ave. to Augusta Ave.
Baldwin St. from Spadina Ave. to Augusta Ave.
St. Andrews St. from Spadina Ave. to Kensington Ave.
Kensington Ave. from Baldwin St. to Dundas St.
Kensington Market is easily accessed from all directions by foot, bike & public transit, and with ample local on-street and lot parking. 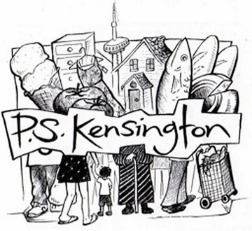 PS Kensington, is a community Street Festival: Human beings feel at their best in vibrant, human scale, friendly environments. Pedestrian Sundays allows us all to flourish in just such a space. Pedestrian Sundays are held every last Sunday of the month May - October.